Each receiver consists of a printed circuit board and a pair of infrared signal detectors. The installation of these receivers requires reasonable care. In order to avoid damage to a receiver it is important to study the installation instructions in detail BEFORE commencing installation. If any steps are skipped or carried out incorrectly the receiver may be damaged. The circuit board must be mounted somewhere in the locomotive. Finding, or creating, a space for the board takes some imagination and creativity in locomotives not designed to accept a DCC receiver. The sensors must be located where they can easily receive the infrared signal from the transmitter. This usually means somewhere on the upper surface of the loco or tender or in the cab. If no suitable location can be found without modifying the locomotive body a hole may need to be drilled in the body shell. In most instances the impact on the appearance of the locomotive cab be minimized by careful planning and the application of some creativity. A list has been compiled (in PDF format - requires Acrobat� Reader) of known combinations of locomotives and specific receiver types. The list may be downloaded by clicking on the heading above. Click on an item name for a document describing installation. If after studying one of the installation documents you decide that you would like assistance with installation, we suggest that you contact one of the third parties who are willing to provide this service. The RX-3N is designed for 'N' Gauge modelers. However, 'HO' gauge modelers with small locos with limited installation space will also welcome this receiver. This receiver has outputs for head light and rear light only. The RX-3N features PWM, high frequency motor drive, to reduce hum and buzz. This receiver is supplied with a pair of Infrared Sensors. A Sensor Mounting Board is available as an option. The RX-3O is welcome news for 'O' Gauge (and indoor 'G' Gauge) modelers. In addition to head light and rear light outputs, this receiver has TWO Auxiliary Light Outputs which may be used for MARS, Strobe or Ditch lights. How these outputs will be used must be specified at the time of ordering. The RX-3O features PWM, high frequency motor drive, to reduce hum and buzz. High frequency motor drive to reduce motor hum and buzz. The RX-3P is the same in all respects as the original RX-3 (which is now no longer available) except it also comes with the addition of a DCC plug. 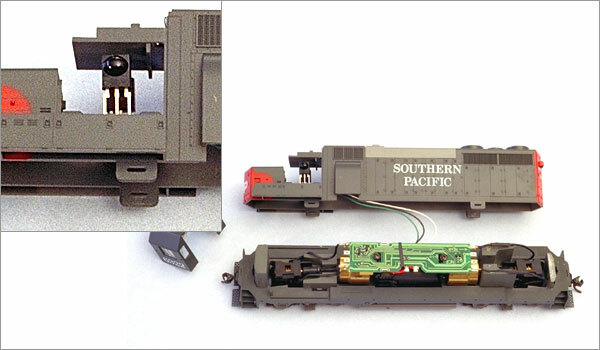 For locomotives lacking a DCC receptacle the plug may be removed and the receiver hard-wired installed. In addition to head light and rear light outputs, this receiver has TWO Auxiliary Light Output which may be used for a MARS or Strobe light. How this output will be used must be specified at the time of ordering. This receiver is supplied with a pair of Infrared Sensors and a Sensor Mounting Board. Each Receiver is supplied with a pair of Infrared Sensors and a Sensor Mounting Board. The Infrared Sensor is a black, �" square unit with a 'bubble' on the surface. 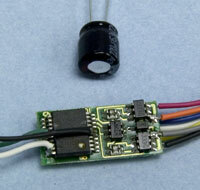 We are now supplying a newer more sensitive Infrared Sensor. The sensitivity has been increased by about 50% over the original unit and this has increased the range of locomotive control by about the same amount. One or both sensors may be used, depending on their location. For example, if installing the sensor in the cab of a diesel locomotive, both sensors should be installed in a back-to-back configuration with the sensor 'bubble' facing outward - as is shown in the photograph at the top of this page. Individual Sensors are also available as a separate item. Optional Sensor Mounting Boards are available.